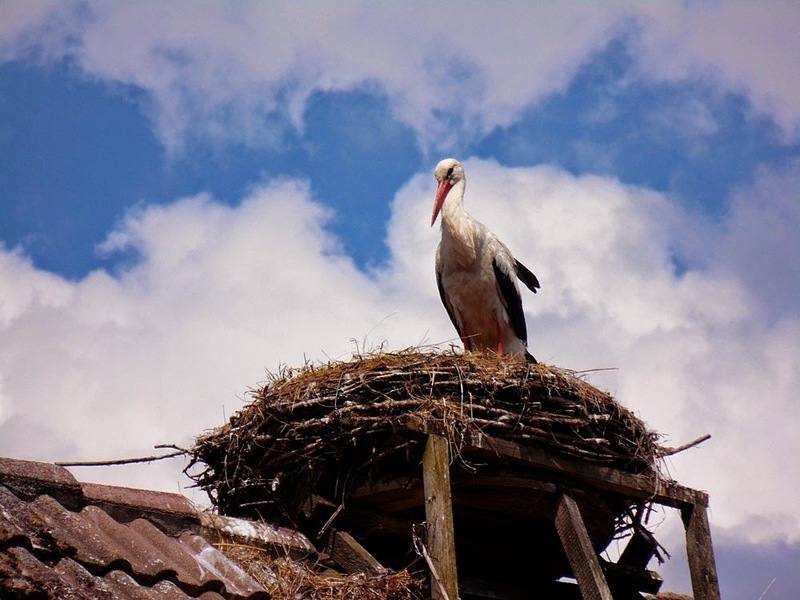 Halle in Saxony Anhalt (Sachsen-Anhalt) has a history that goes back deep into the Bronze Age because of its importance as a place where salt was harvested. The preponderance of salt came to be in this area because of the presence of a geological tectonic fault-line, die Hallische Verwerfung, that runs underneath the marketplace. 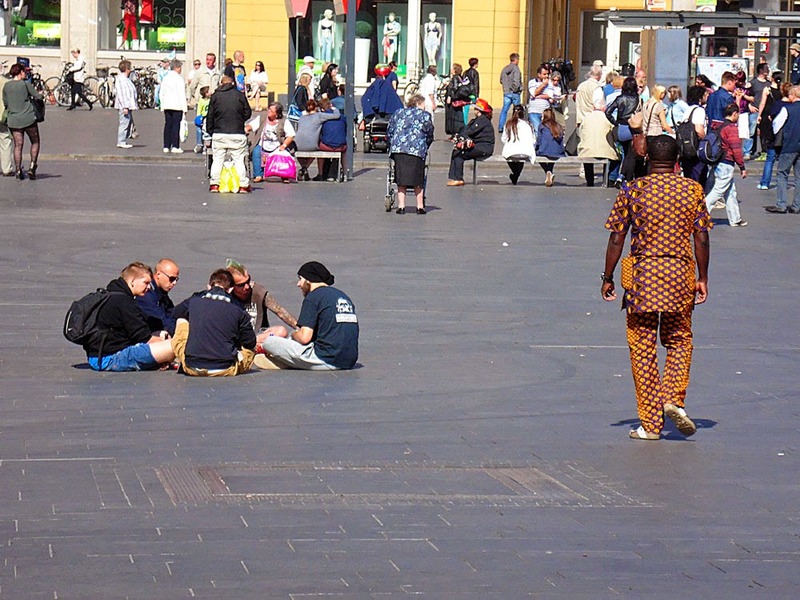 There is a geoscope in the market square where you can actually peer down at it - should you want to. It could be that the town's name is derived from a Celtic root that means 'salt' (compare Halle with the Welsh word for salt is halen). 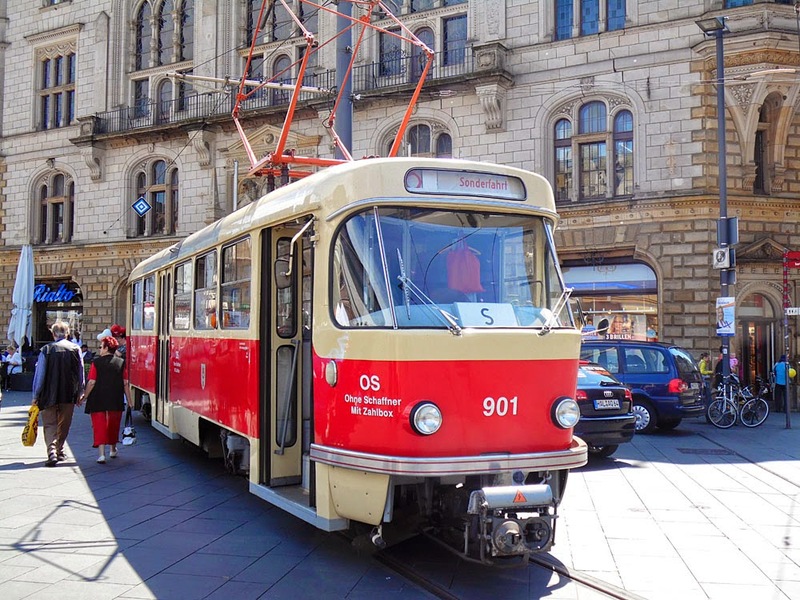 As could the tributary of the Elbe on which it lies, die Saale; (Latin sal, from which we get salt, Germans get Salz, the French get sel, and so on). However, the river's name might just as likely be related to the Proto-Indo-European *séles (the asterisk means it is a conjectured word) which means 'marsh'. We just don't know; it is all so long ago. 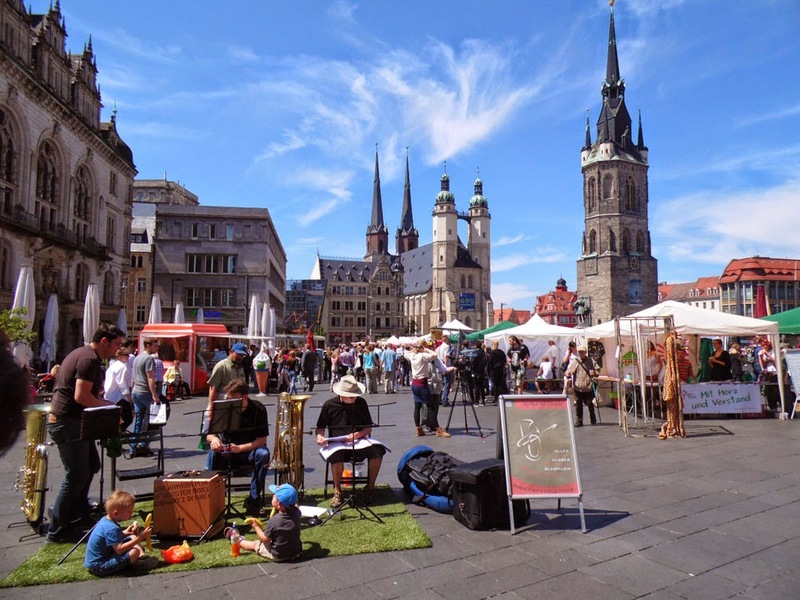 Whatever, it is upon salt that the prosperity of this town is built, leading to the development of a powerful, independent-minded merchant class in mediaeval times and becoming a member of the Hanseatic League in the 13th and 14th Centuries. 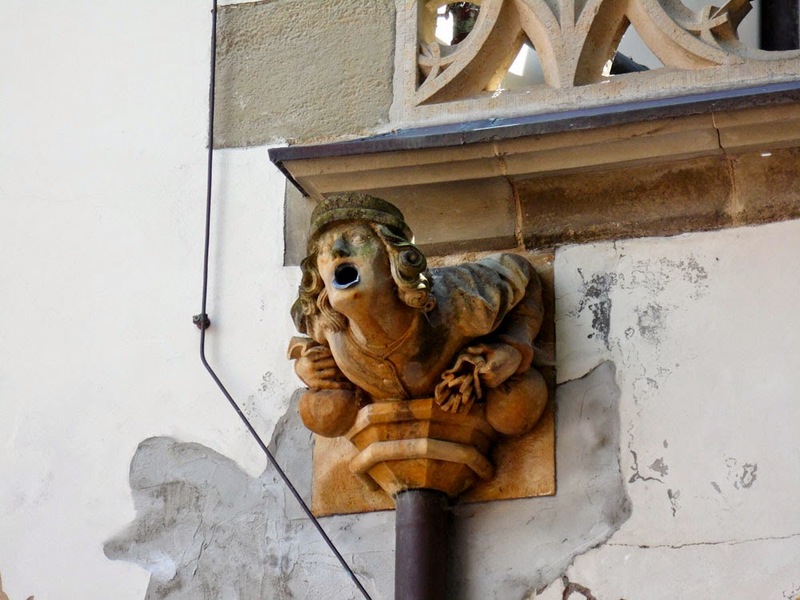 Halle is also the birthplace of Georg Friedrich Handel in 1685, a fact you are constantly reminded of as you walk around the town. I wonder if the women is listening to his Messiah on her headphones? 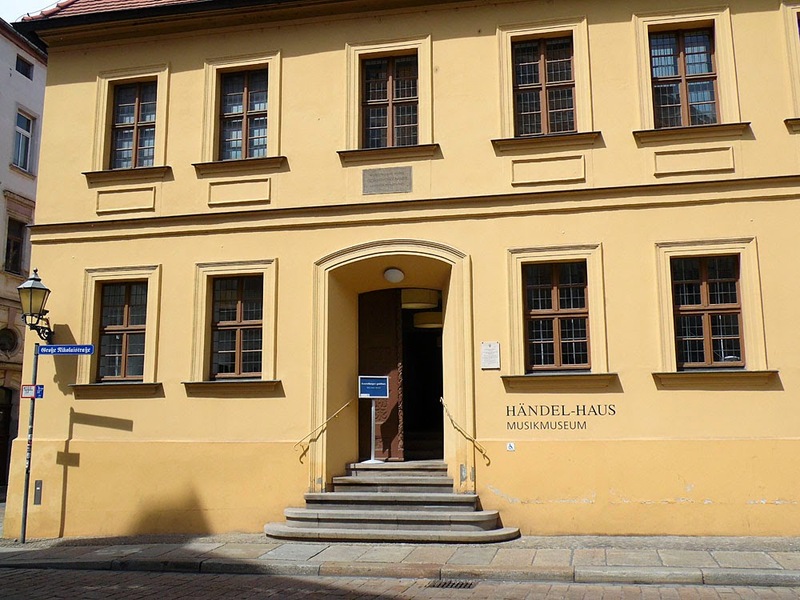 Handel looks at the church where he was baptised and had his first organ lessons. 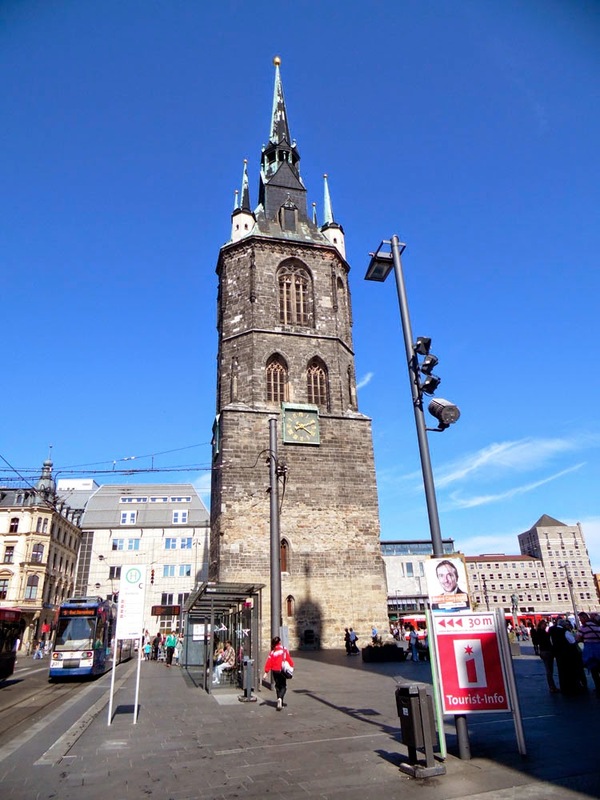 Halle is known as die Stadt der fünf Türme because of the four towers on the Marktkirche Unser Lieben Frauen (the Market Church of Our Dear Lady) together with the Roter Turm (Red Tower) campanile. 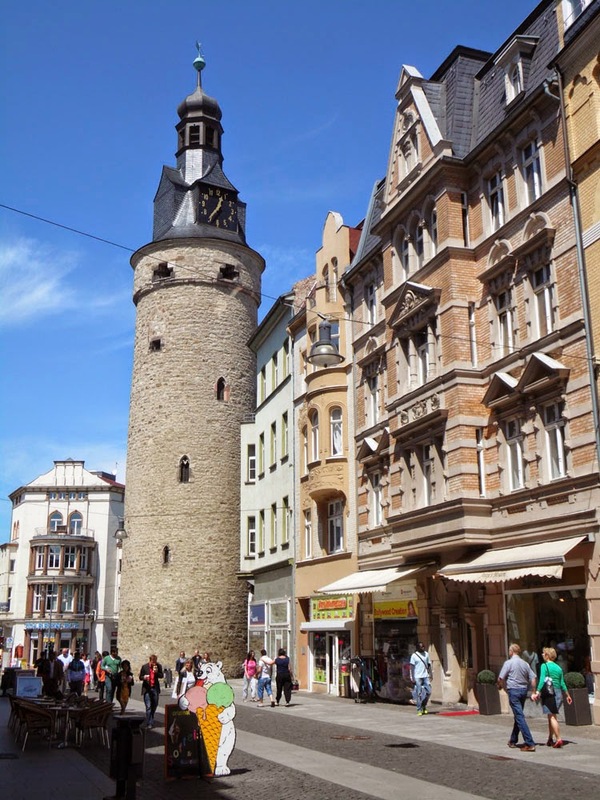 However, the first tower a visitor to the Altstadt is likely to see - arriving from the direction of the train station (after a dreary walk through a hinterland of concrete civic architecture, bargain shops and 'ethnic' food outlets) - is the 44m high Leipziger Turm (Leipzig Tower). 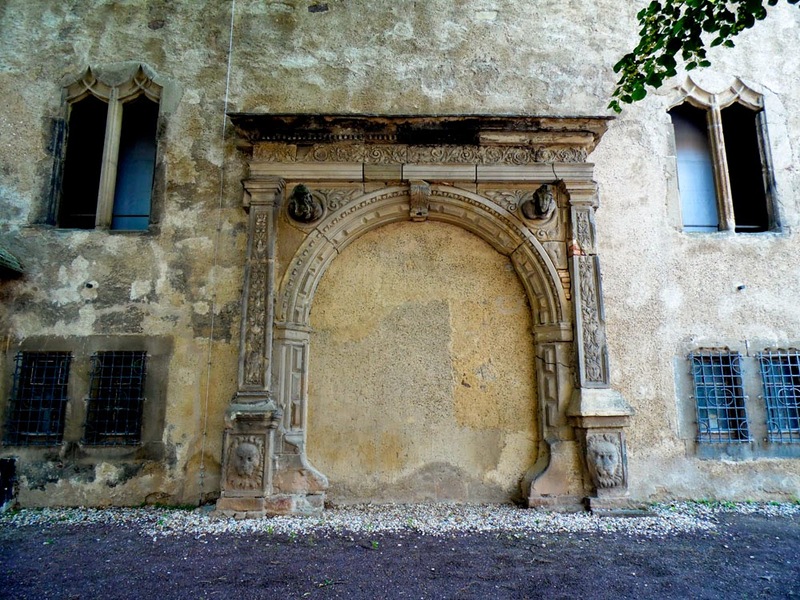 This used to stand next to the City Wall gate called the Galgtor (demolished in 1819). 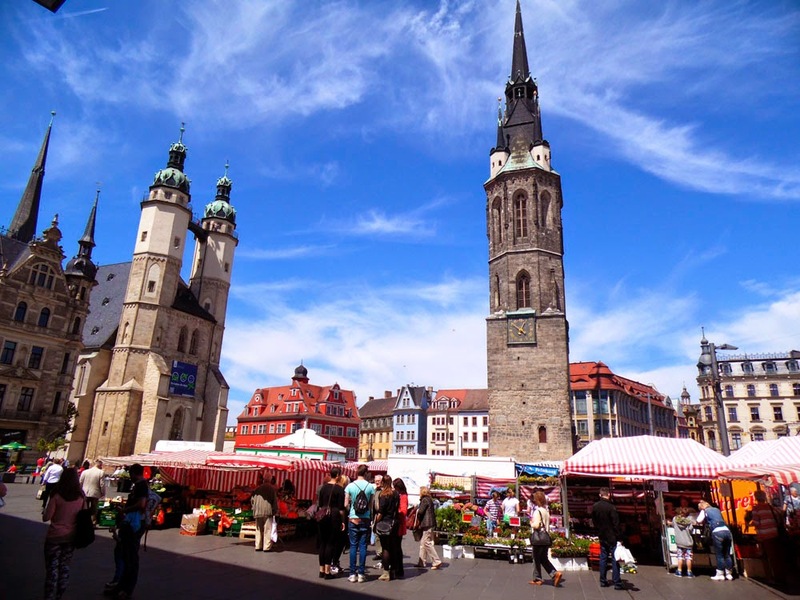 We visited Halle on a Saturday, and the Marktplatz was living up to its name with a busy, bustling market. 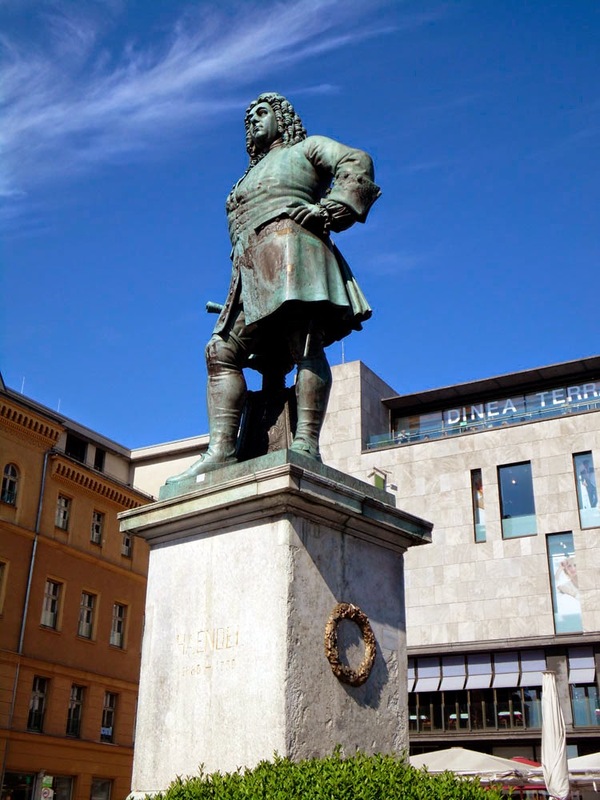 Also there is the usual Roland Statue, which you find on the marketplace of all German towns that have gained an amount of liberty from their noble overlords. This one is a 1719 replica of a wooden one that dated back to the thirteenth century. If the two towers seem crooked to you, it is not your eyesight (or my camera) but because that tectonic fault I spoke about earlier runs right under them and sometimes the land slips. 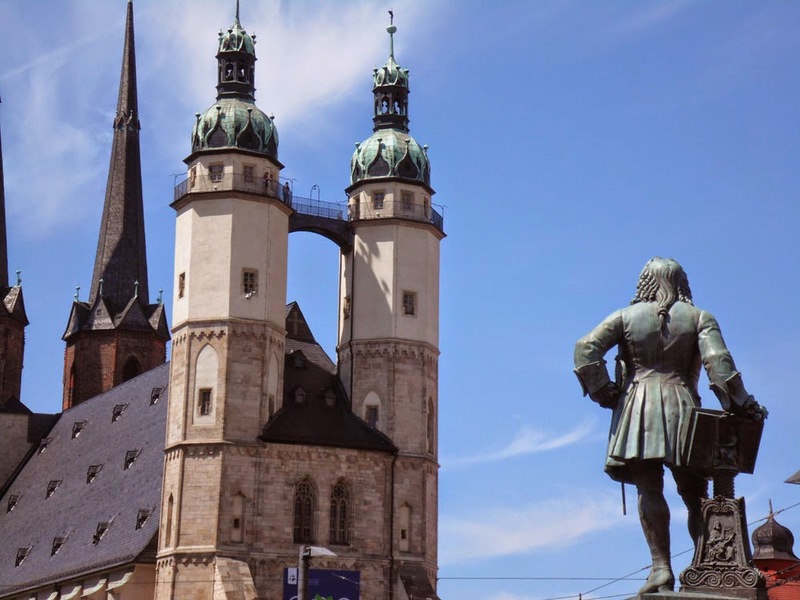 How two churches became one came about through the threat of the Reformation. 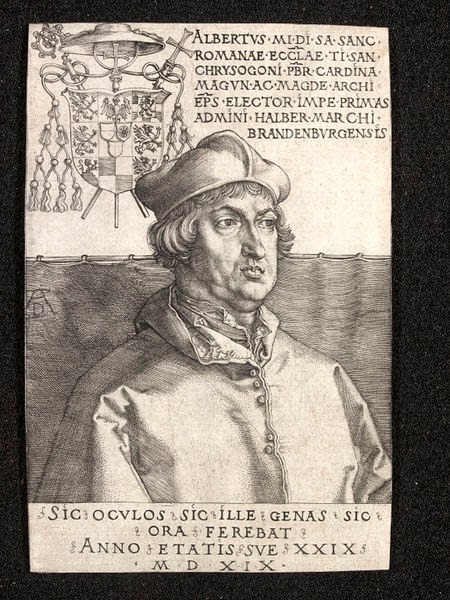 Cardinal Albrecht of Brandenburg, Archbishop of Magdeburg and Elector of Mainz, was a bit of a religious collector. In fact he acquired an amazing 8,100 sacred relics and 42 holy skeletons. His collection out-grew his spare room and he wanted somewhere to store his precious pile of holy body parts. 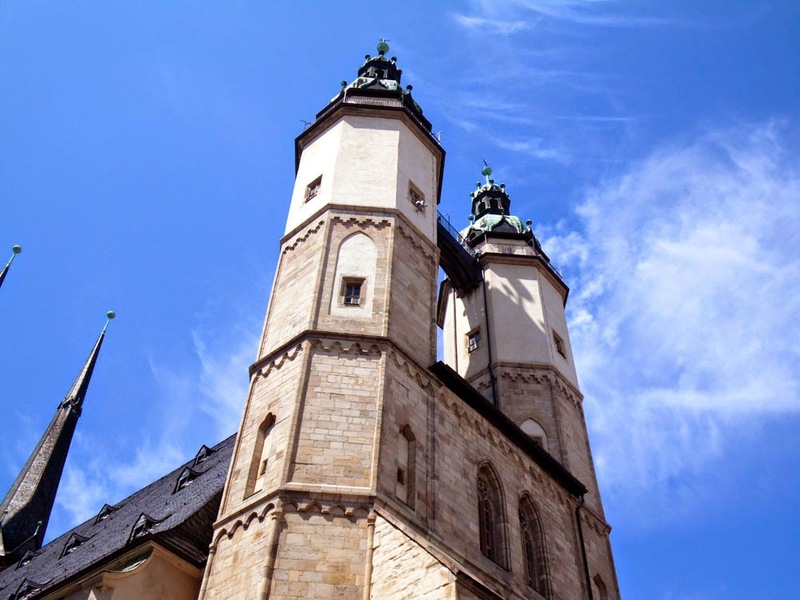 Meanwhile, a certain Martin Luther had nailed his 95 theses to the door of All Saint's Church, Wittenberg, and sparked off the Protestant Reformation which you will perhaps recall has a few things to say about the sale of indulgences and the trade in holy relics. 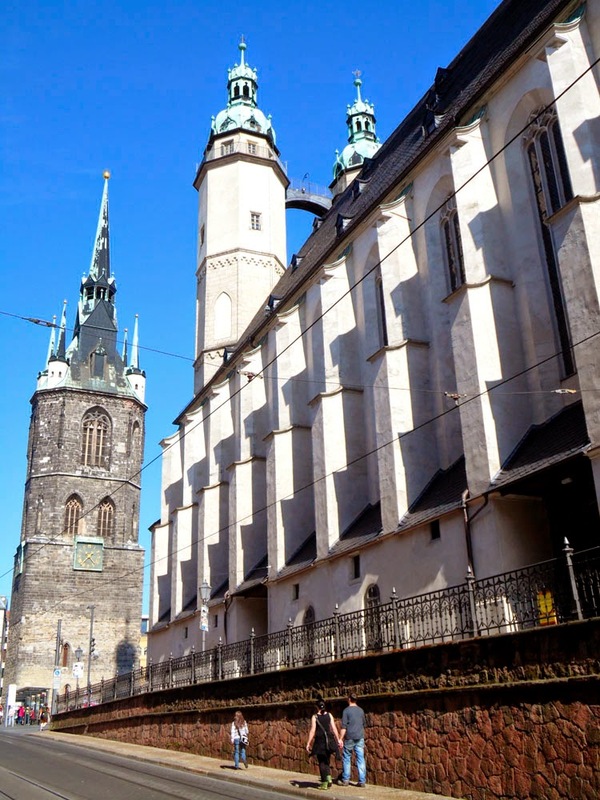 It was through the sale of indulgences that Albrecht raised the money to buy his relics. 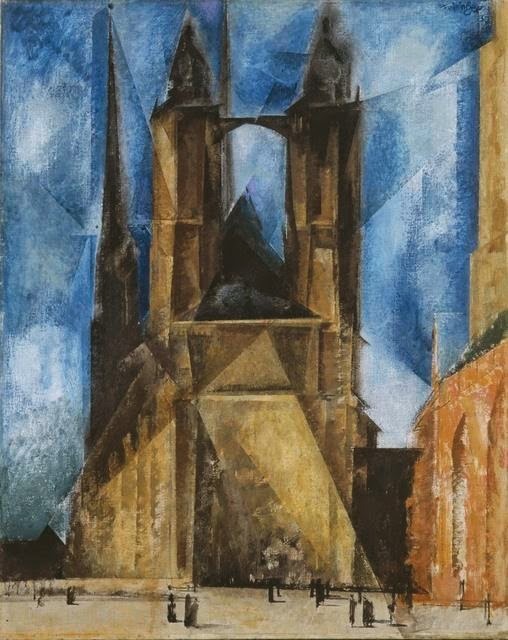 The good catholics of Halle thought that the best way to tackle the Reformation was to get the people excited about the mysteries of Roman Catholicism and to do this by building bigger churches of worship, with more elaborate symbolist decoration, and holding grander masses and services. So they decided to demolish the two parish churches and knock them through into one enormous one dedicated to Holy Mary Mother of God. 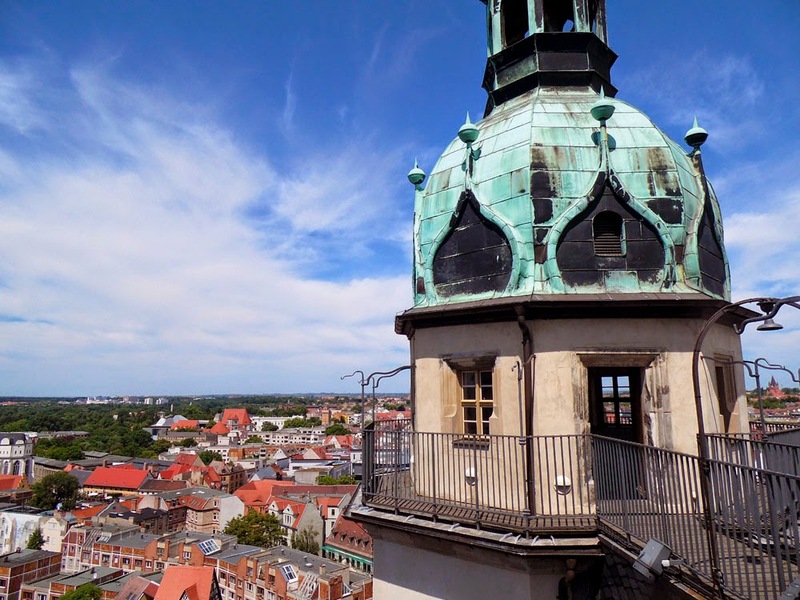 Hey, and this would be a cool place for Cardinal Albrecht to store and show off his relic collection, which became known as the Hallesches Heiltum. Used as the title page of 'the Hallesche Heiligthumsbuch (Halle 1520), a book with woodcuts designed by Dürer's pupil, Wolf Traut, illustrating the reliquaries of Halle belonging to the cardinal. 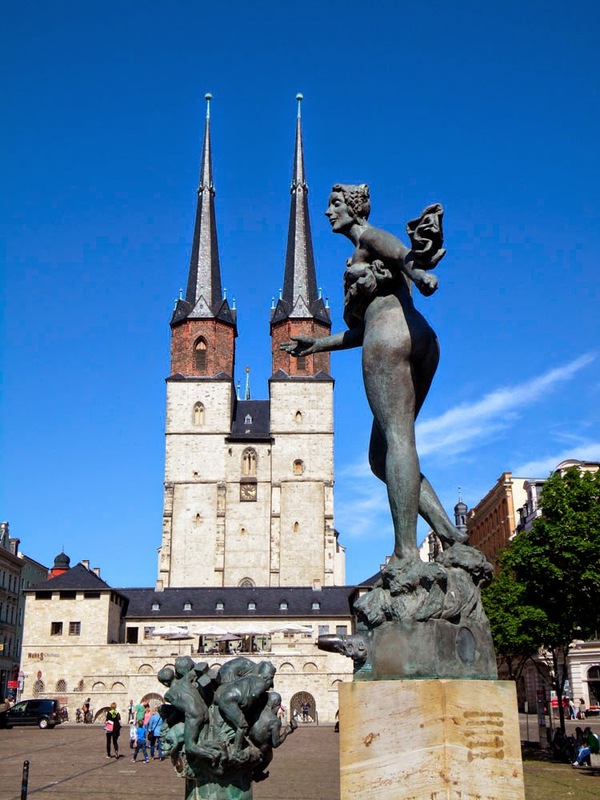 Work began on the big new church in 1529-30 with the demolition of the nave of St. Gertrude's, and went on until the Marktkirche Unser Lieben Frauen was completed in 1554. 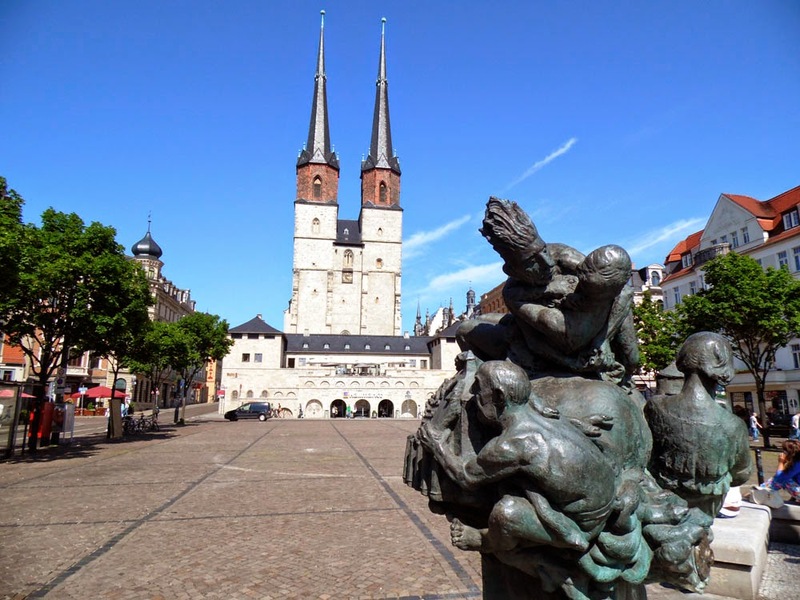 By this time, the town had become Protestant (in 1540) and Cardinal Albrecht had fled his residence in Halle on the Moritzburg and taken his relics with him to Aschaffenburg in the still Catholic Bavaria. His relic collection has been scattered and lost over the centuries, and now only about twenty relics - and these mostly fragments - have survived the test of time. 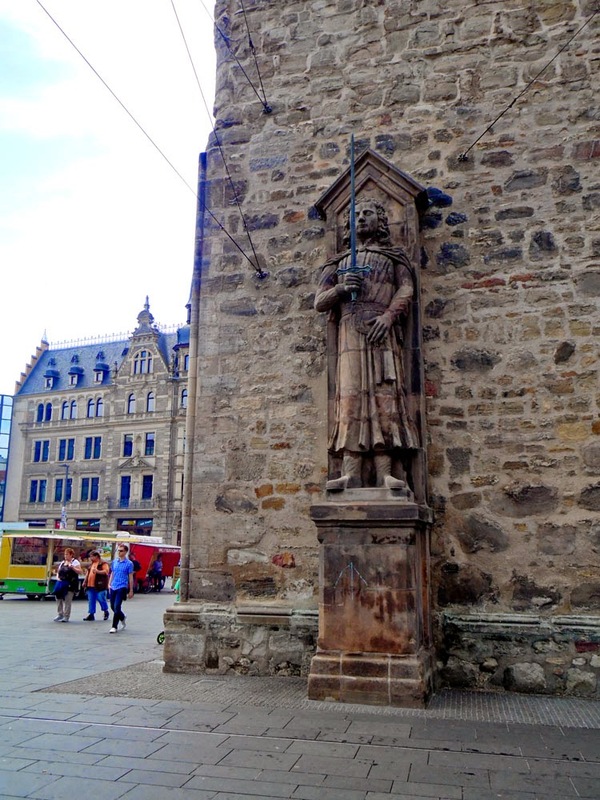 Looks like Martin Luther had the last laugh, and his portrait and a memorial is pride of place on the wall between the two eastern towers. 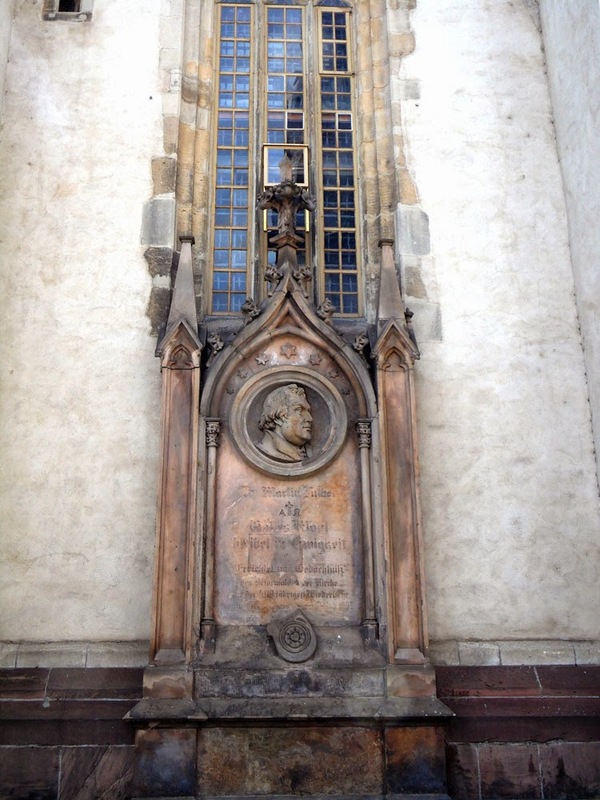 Martin Luther memorial on the Liebfrauenkirche. 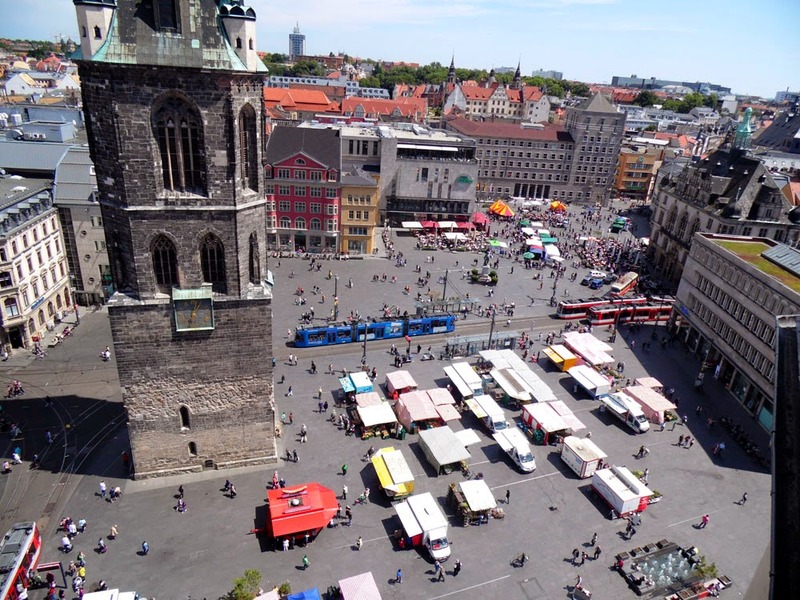 Looking down on the Marktplatz from the bridge connecting the twin towers. I always found it strange that a composer born in the heart of Germany would go on to become the saviour of English opera, sacred, and choral music, but now it makes sense. 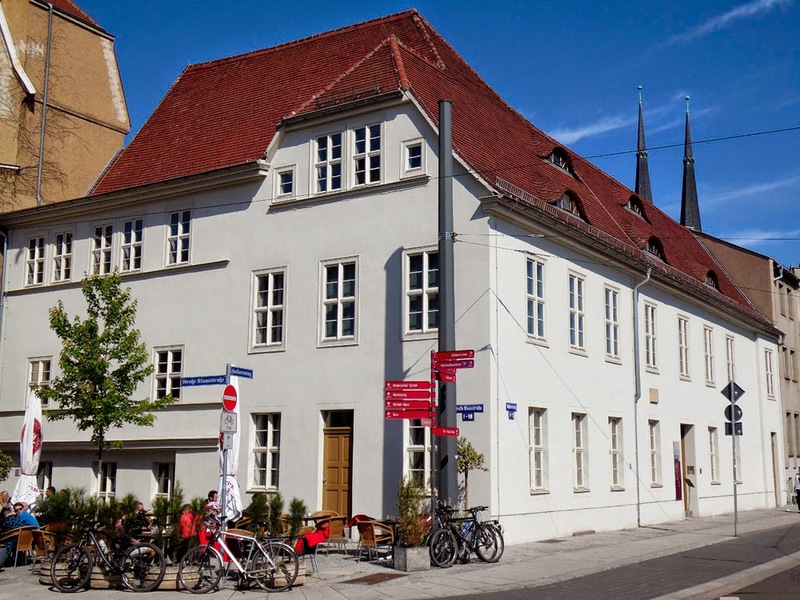 In 1710 Handel took the office of Kappelmeister to Georg Ludwig, prince-elector of Hannover, who succeeded to the throne of Great Britain in 1714 as King George I. Handel provided the musical entertainment for the King whilst George was in Britain kinging it up, and liked the place so much he lived there the rest of his life. It is sort of curious to think that if any of Queen Anne's seventeen pregnancies had produced a surviving heir, then the Stuart line might not have died out, and the throne not passed to her second cousin George of the house of Hannover, and then English music would have been uninfluenced by the glorious beauty of Handel's many works. 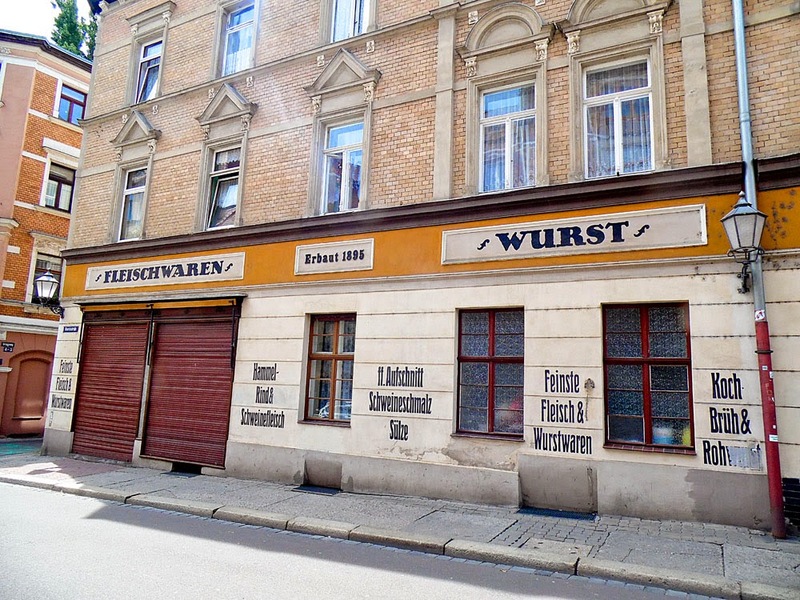 The maze of back-streets around here combine modern concrete Plattenbauten with relics of an earlier era. 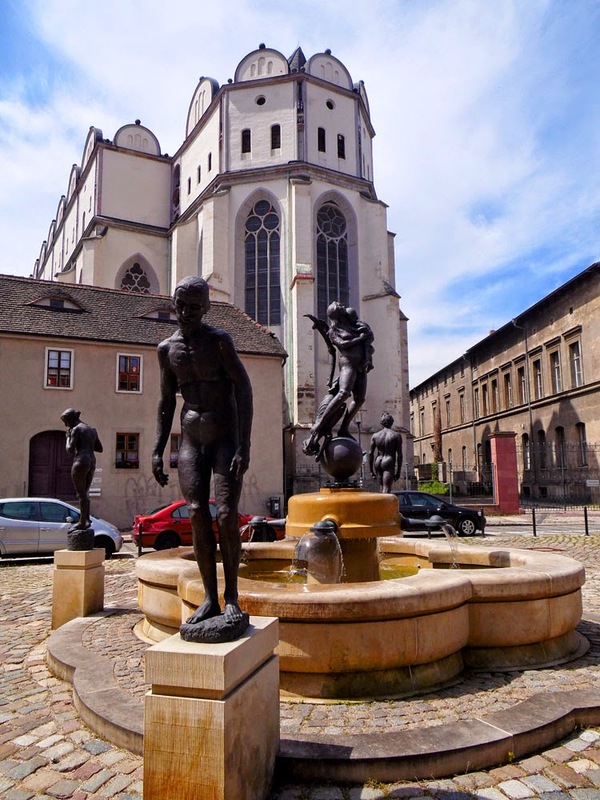 It is not far from the Händel-Haus, up the slight hill, to the Hallescher Dom (Halle Cathedral). It isn't much to look at from street level, but apparently it looks quite awesome inside. 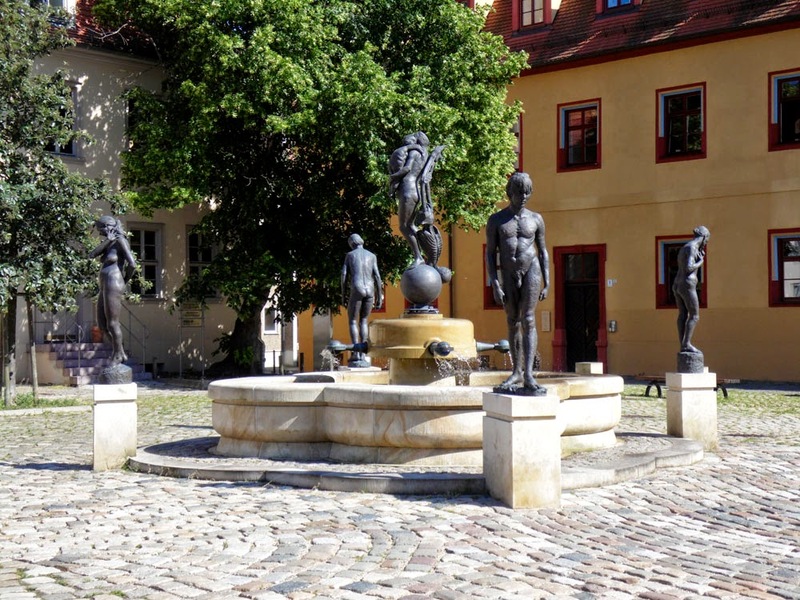 The Domplatz outside has a tinkling fountain surrounded by some rather scary bronze nudes that seem to be lurching out of a zombie apocalypse. 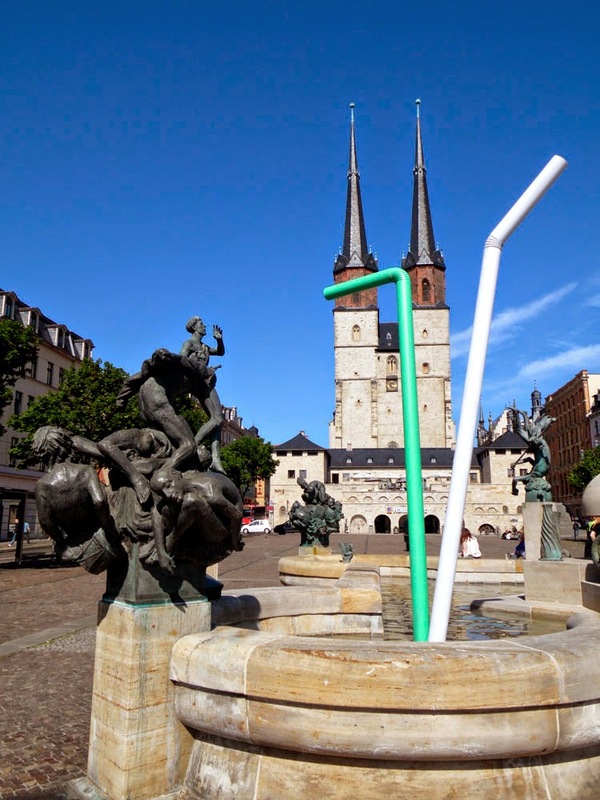 I am sure that wasn't the intention of local artist Horst Brühmann who created this in 2012. 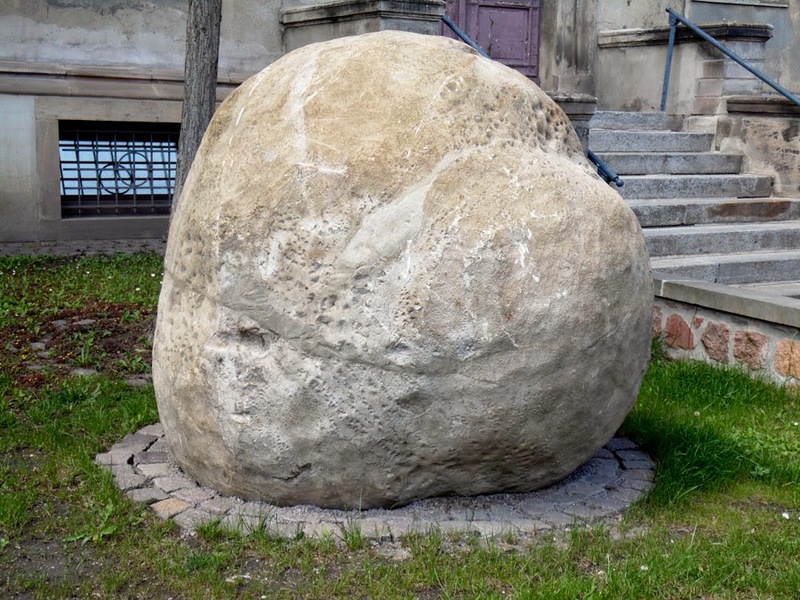 More interesting (to me, anyway) was a 1.5m diameter, 5 tonne sphere of calcite in front of the old Universitätsklinikum building. This so-called Reisenkalzitsphärite was formed about 47 million years ago and was discovered SW of Halle in the Geiseltal region whilst digging for Braunkohl. If cracked open, there would be enough crystal in that to keep Glastonbury New Age gift shops in business for a century! It was all a bit bright on the eyes so we carried on up the hill to the impressive Moritzburg. 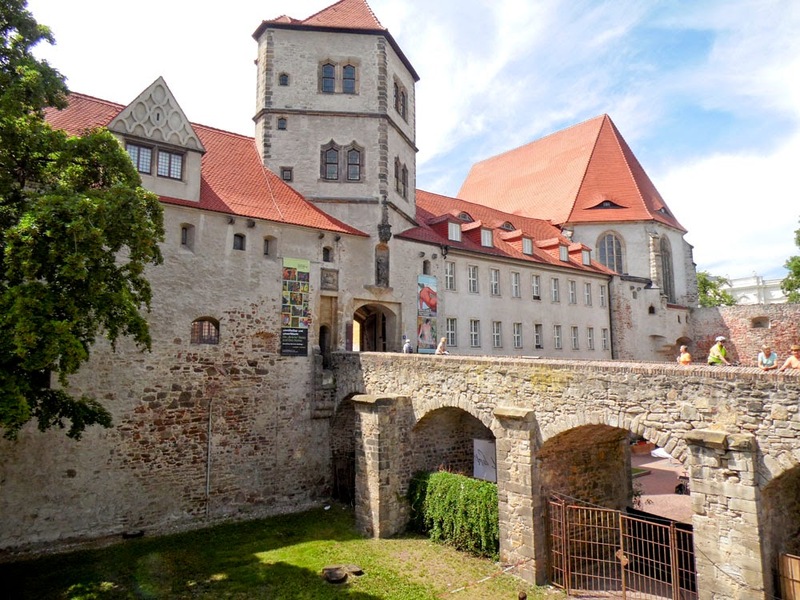 This is a fortified castle that became the residence of the Archbishops of Magdeburg, including the relic fanatic Cardinal Albrecht. Construction of the Moritzburg began in 1479 to consolidate a coup which led to the town coming under the control of the troops of the Archbishop of Magdeburg (Archbishop Ernest II of Saxony, only fourteen at the time). 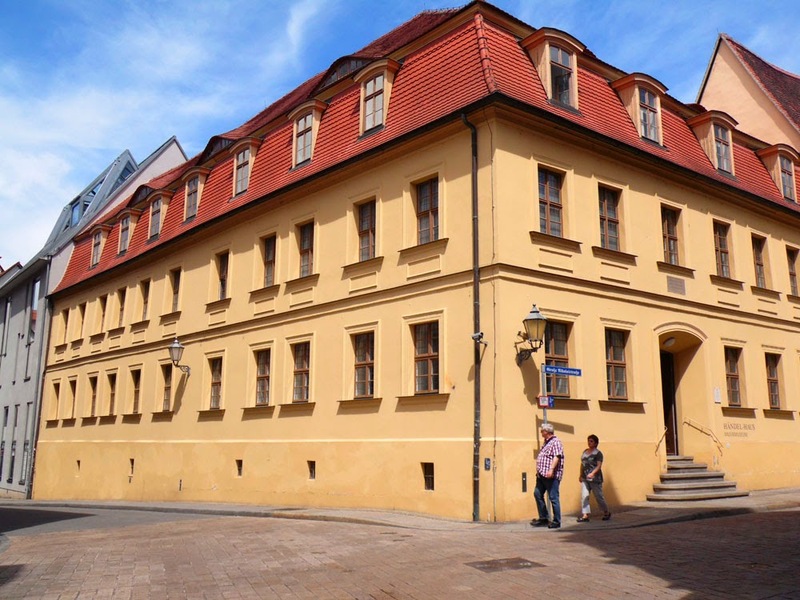 It was built on the site of a former Jewish settlement NW of the town centre, incorporating the town walls. 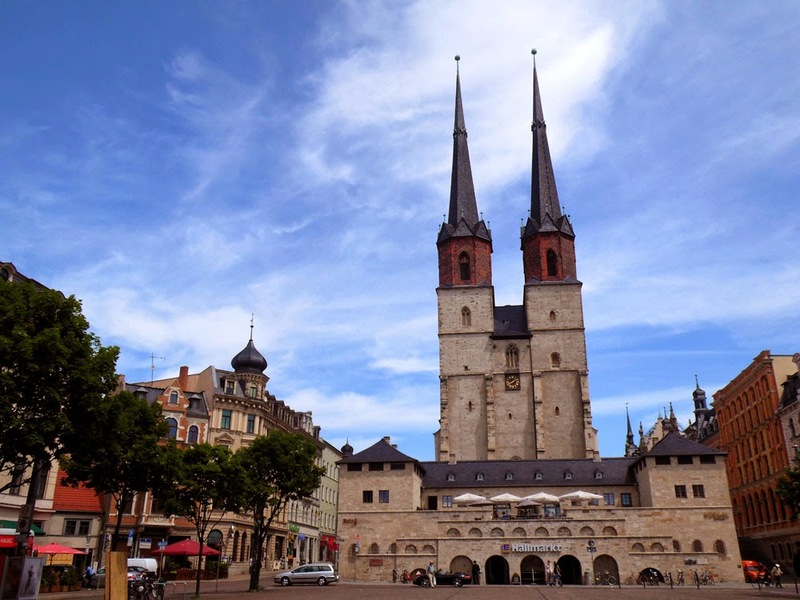 Archbishop Ernest personally laid the cornerstone of his new residence on May 25, 1484 in a ceremonial procession and named the castle Moritzburg after Saint Maurice, the Patron Saint of the Holy Roman Emperors. 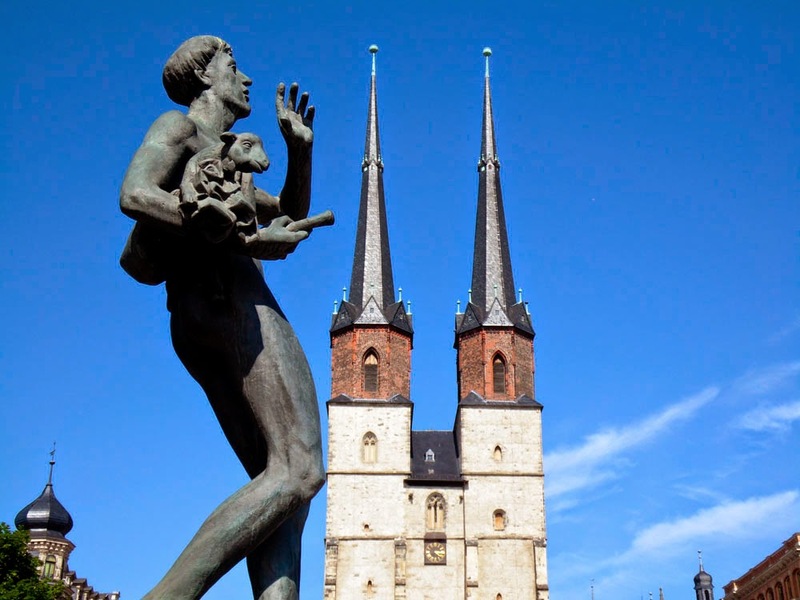 The Magdeburg Dom is also dedicated to Saints Catherine and Maurice, where there is the oldest know depiction of St. Maurice (sculpted in the 13th Century). 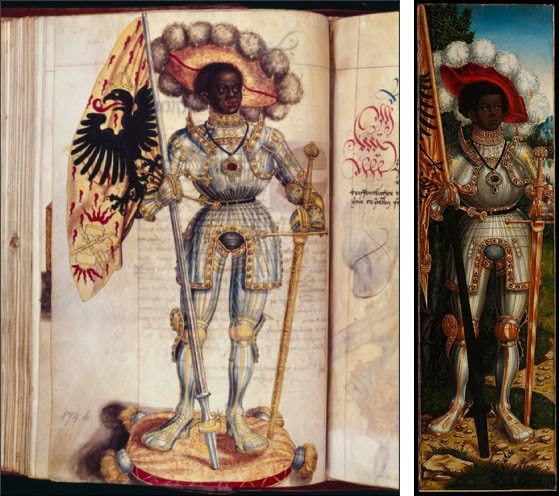 As patron saint of the Holy Roman Emperors, St. Maurice is depicted holding the Holy Lance or Heilige Lanze, the name of the lance that according to the Gospel of John pierced the side of Jesus when he hung on the cross and was infused with his blood. This holy relic was in the possession of the Habsburgs (who were most often Emperors of the Holy Roman Empire) and became known as the 'Spear of Destiny', not only giving its name to a 1980's rock band but also spawning numerous conspiracy theories about Hitler (that he invaded Austria to obtain the Spear of Destiny; that it ended up on board the sunk German submarine U-534 along with a horde of Nazi gold; that it was shipped to Antarctica in the closing days of the war for safe keeping, etc etc). 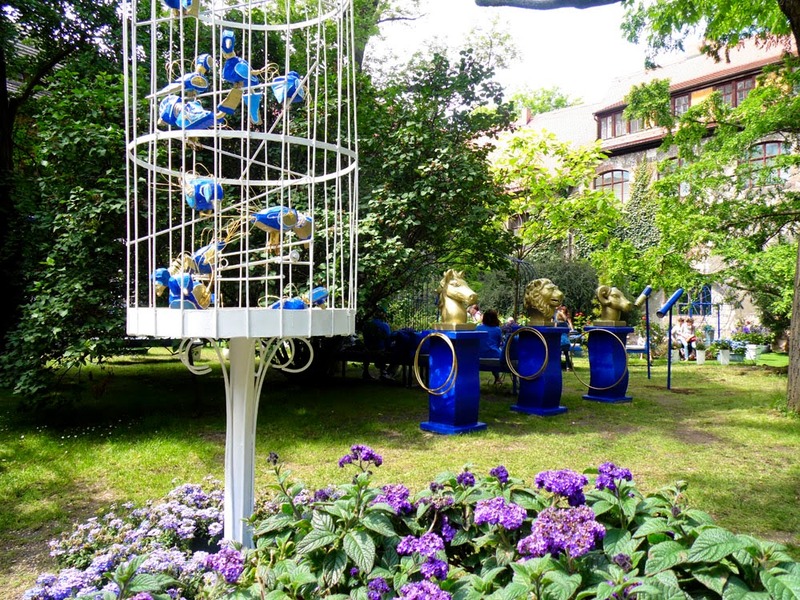 The courtyard of the Moritzburg is nowadays a peaceful place to relax away from the bustle of a Halle market-day, with a pleasant cafe. Entrance to the Kunstmuseum Moritzburg, and the cafe. 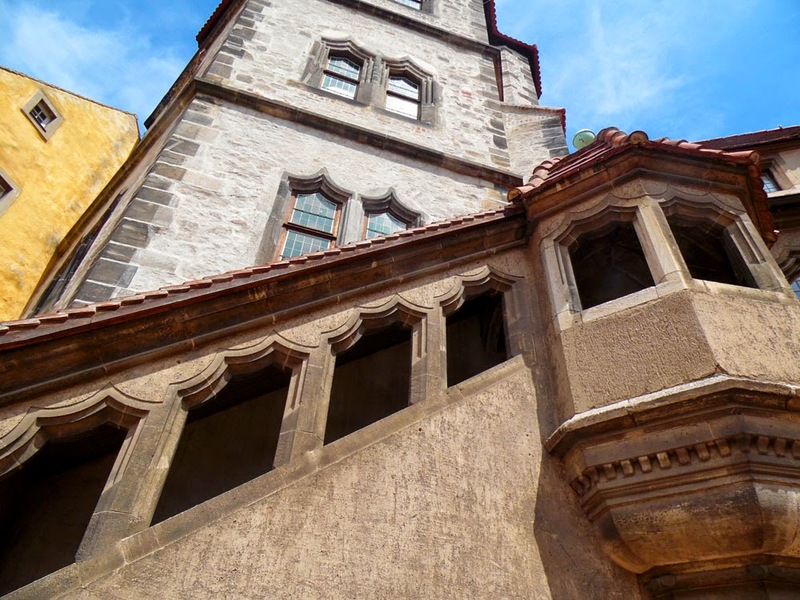 But for now, no time to be wandering around art galleries, there is still a lot of Halle to explore! 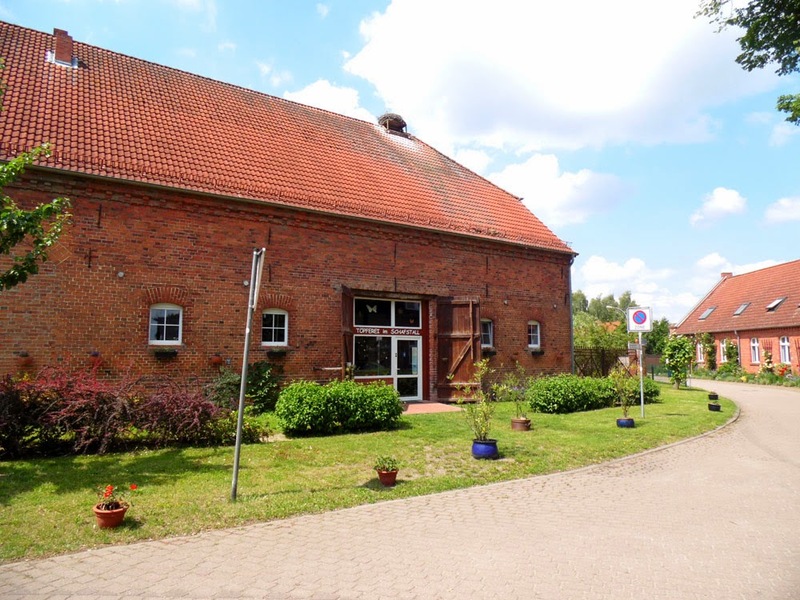 We meandered NW of the town centre, along the banks of the river Salle, through the delightful Würfelwiese and Ziegelwiese; lovely parkland meadows to jog, or walk your dog, or just lie in the sun. We had been promised Drachenboote Rennen (dragon boat racing) today, but didn't see any. 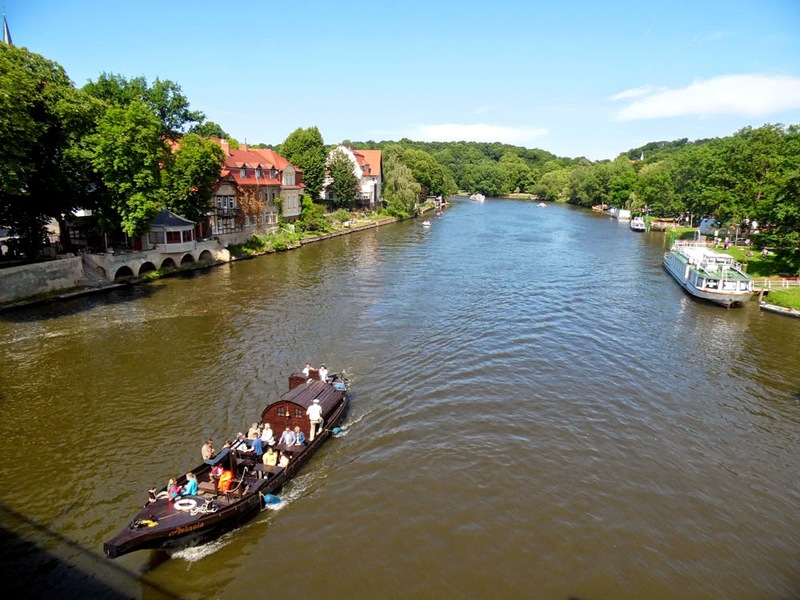 As we came to the cliffs of the Giebichenstein it looked like there were plenty of places to hire other kinds of boats, or embark on a guided boat trip. We didn't feel like messing about on the river, and instead climbed to the top of the cliffs for a panoramic view of the tops of trees and the five towers of Halle in the distance - not very photographic, or particularly worth the climb. 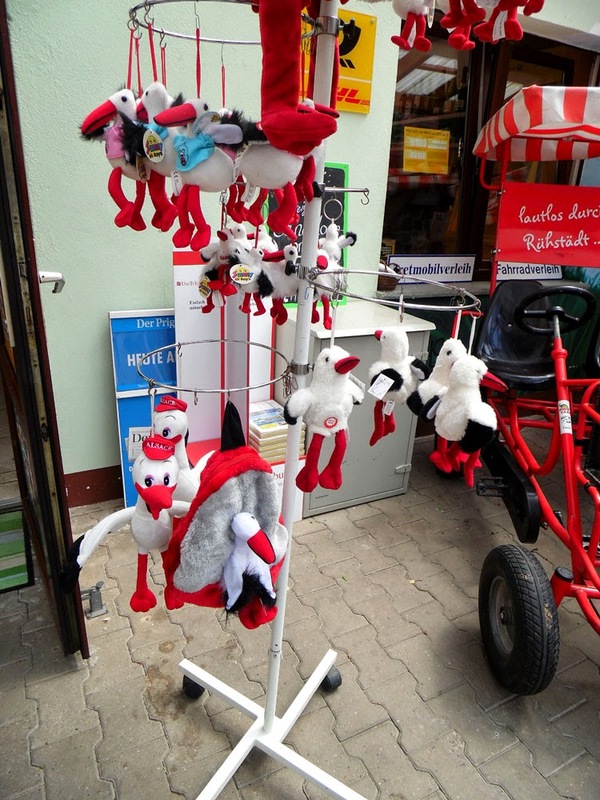 Making our way along the northern edge of the Giebichenstein along the Riveufer, we found ourselves in the middle of a mediaeval market fair, a not uncommon experience in Germany. 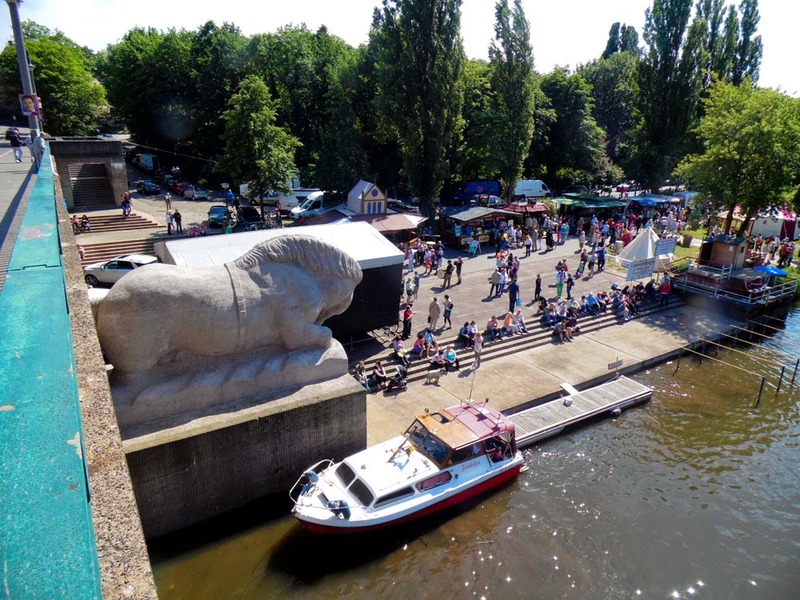 Here is looking down on it from the Kröllwitzer Straße bridge, which has two impressive, massive sculptures of a horse and an ox at the foot of it. 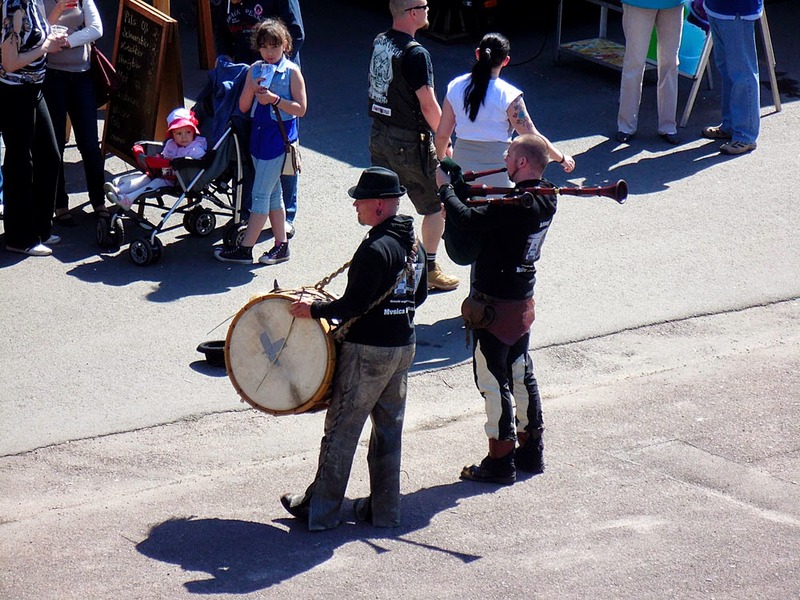 Nothing says mediaeval better than a Dudelsack player and drummer. Fact! 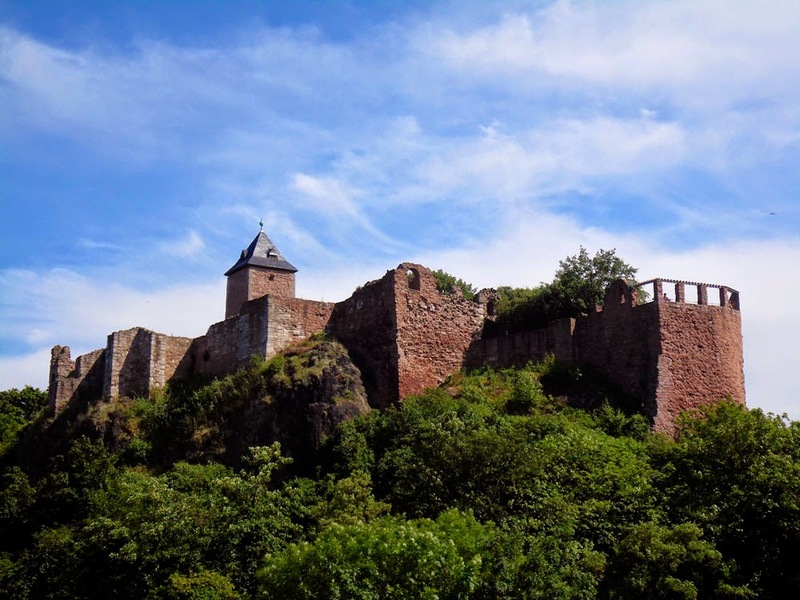 Looking down on the merriments were the ruins of Giebichenstein Castle. 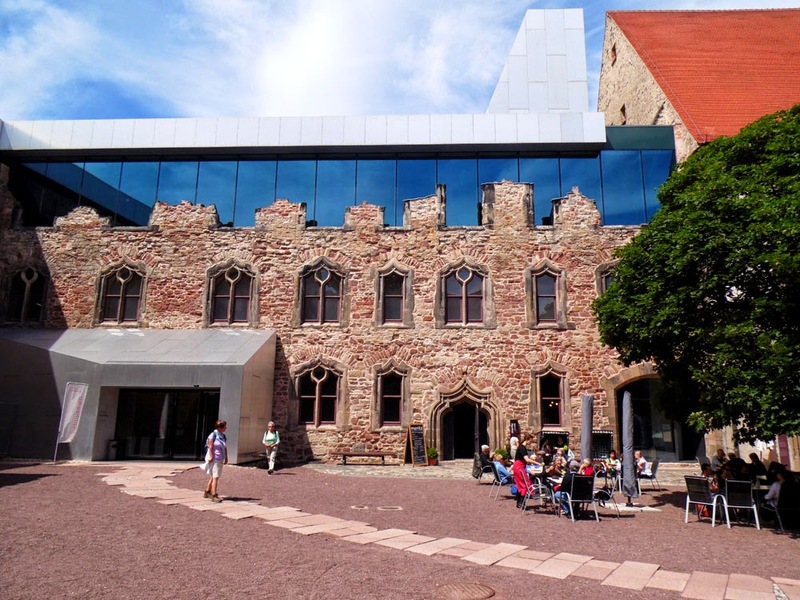 It is now one of the two campuses of the Burg Giebichenstein Art School, but it dates back to the town's defences of the 9th century, and was the residence of the Archbishop of Magdeburg after he had taken over ruling Halle and was waiting for the Moritzburg to be built. 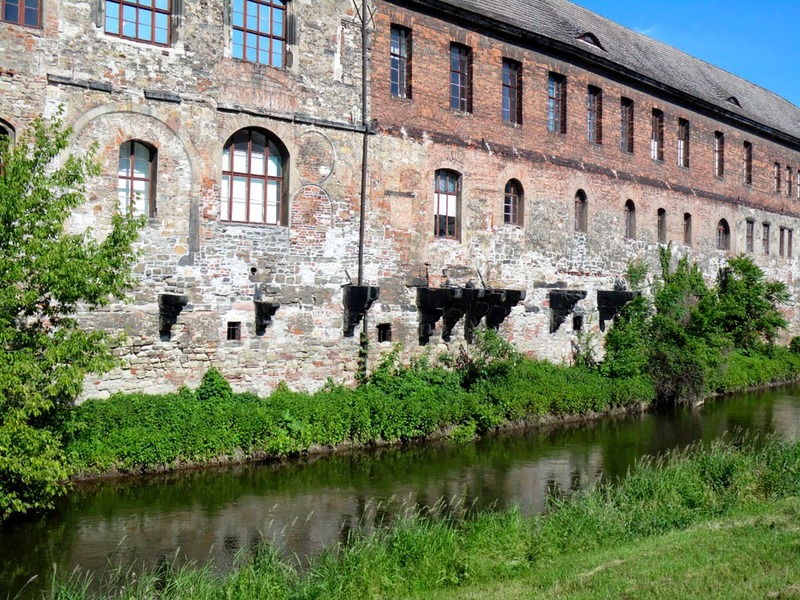 The Saale meanders off northwards, and looks like it has more pleasurable riverside walking in store, but time was against us, and we caught a tram back into the centre of Halle. 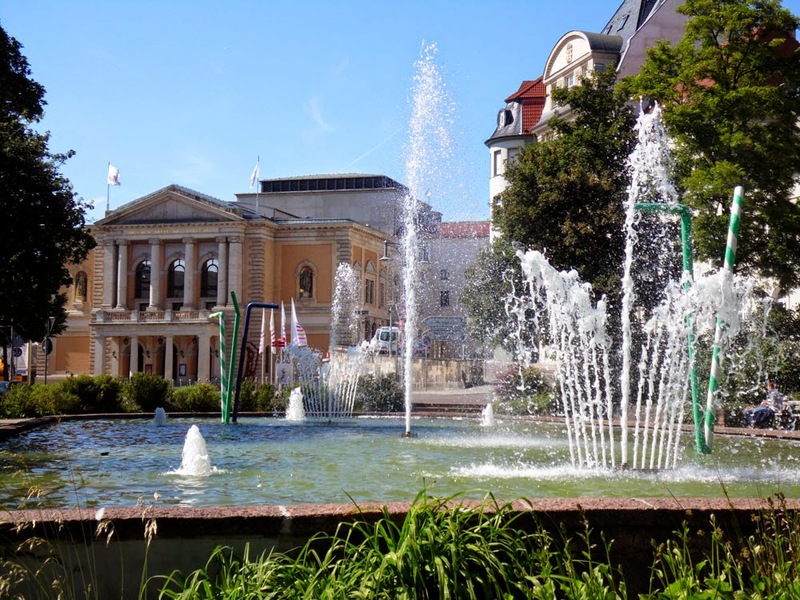 On the way back to the town-centre we stopped off at the Opera House for a look at its neo-classical façade and enjoyable fountains. And with a few diversions to photo some other interesting buildings, back to the train station and the long journey home. 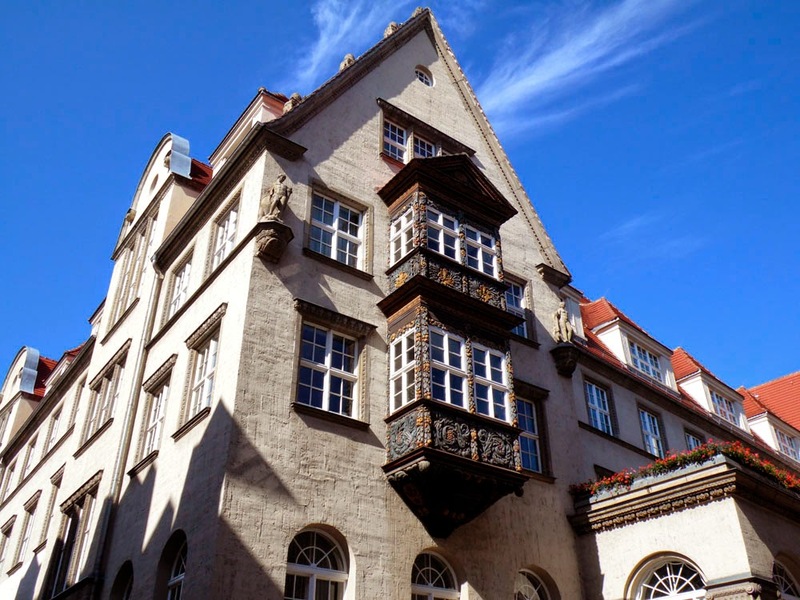 Some other nice-looking house in Halle; there's lots of them. You can't expect me to remember what all of them were called, can you? Thanks to Wikipedia for helping me research the background history, but note to Google that I did not mean to search for the Hallé Orchestra or anything about Halle Berry! 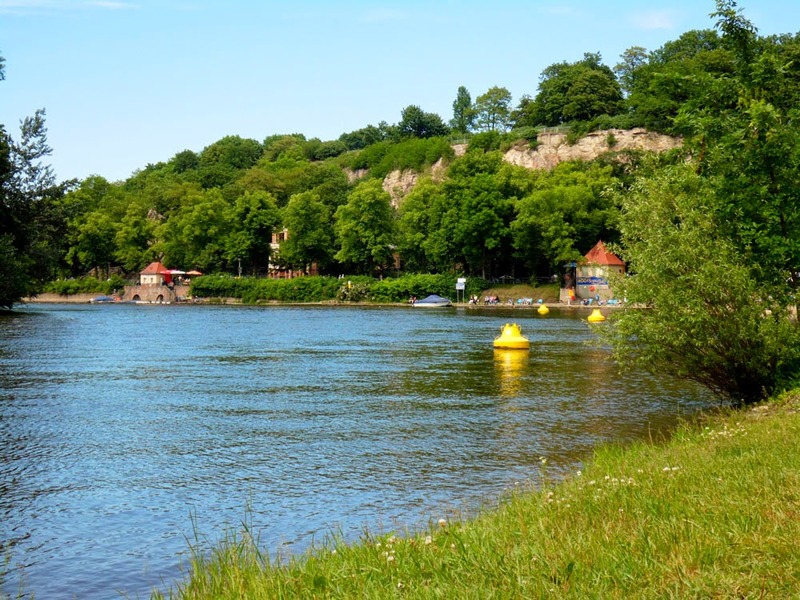 Today we had a pleasant cycle alongside the river Elbe in north-west Brandenburg from Wittenberge to Bad Wilsnack. 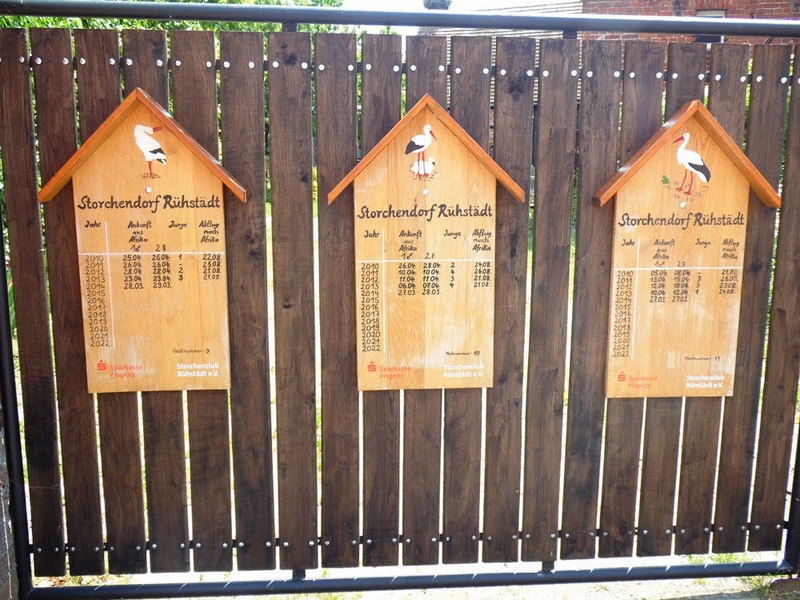 Along the way we called in on Rühstädt, which in 1996 was given the title Europäisches Storchendorf (European stork village). 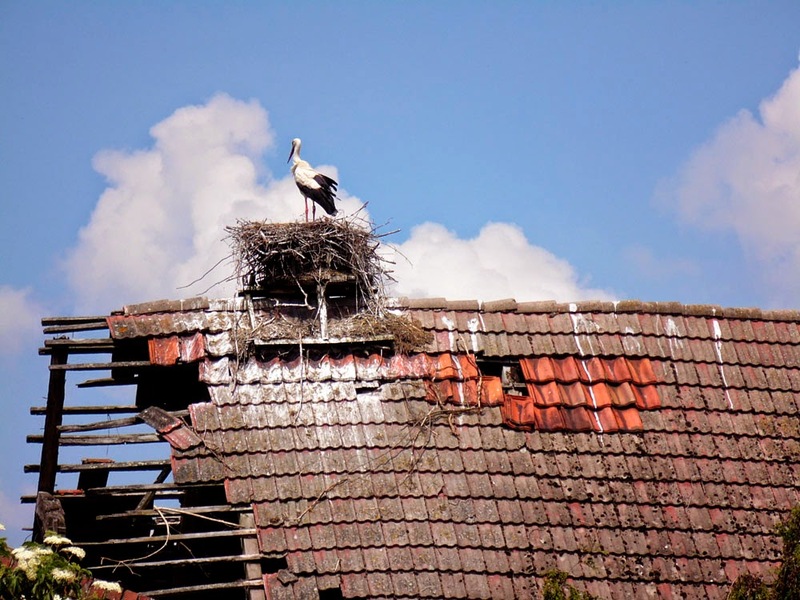 It is not hard to see why; as soon as you enter the village you are met with the delightful sight of stork nests on top of nearly every roof. 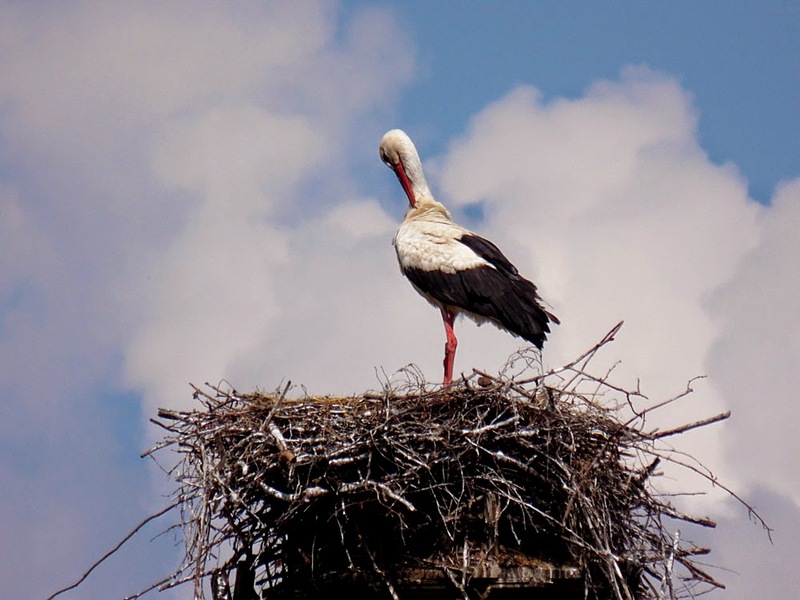 Usually the village gets over forty nesting pairs between April and August. 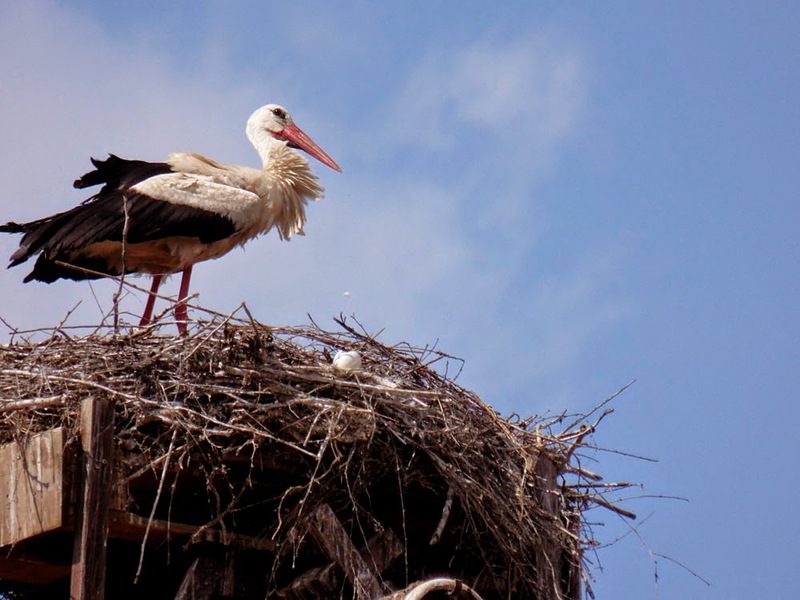 Every nest has a board at street-level recording when the storks arrived and how many offspring they had. 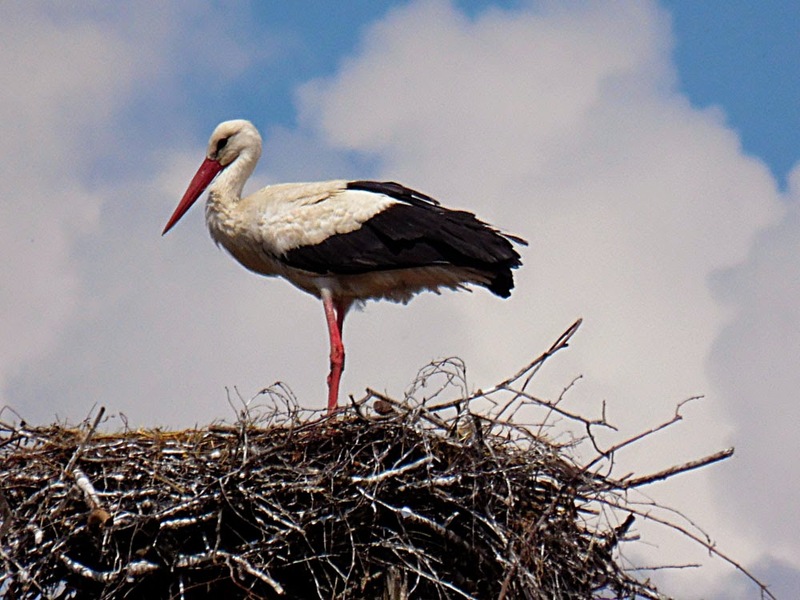 The practice of providing nesting-sites for them began in the 1970's, when there were seven nesting pairs who had nine youngsters, but the environment around here is perfect for storks (fish, frogs and snakes in the wide gentle Elbe and acres of beautiful meadows) and with a bit of encouragement the numbers who returned just grew and grew. Naturally, the small village (population 240) gets a lot of visitors to see this spectacle, and who could begrudge the locals from making a small revenue from their unique spectacle. Incidentally, this Minimarkt near the village church also does a good line in everything you could possibly make out of sanddorn too. 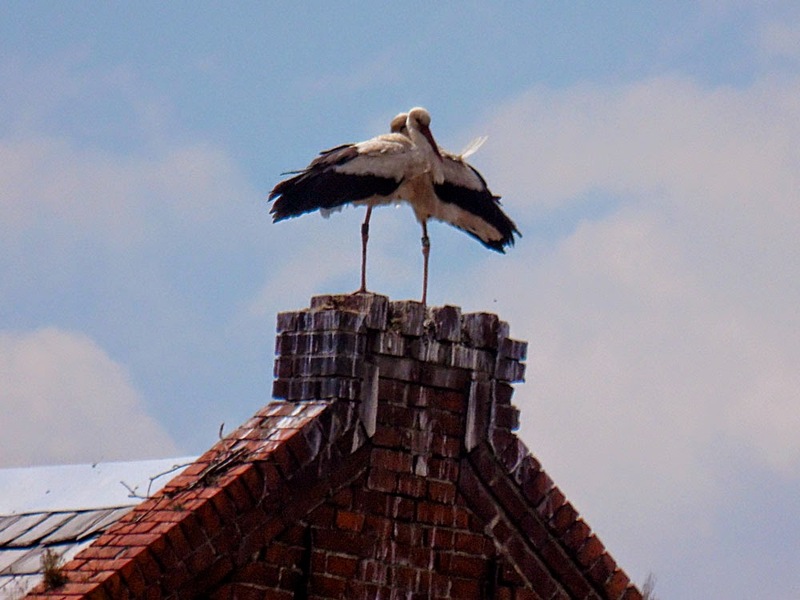 But it is for the real storks that people 'flock' here. 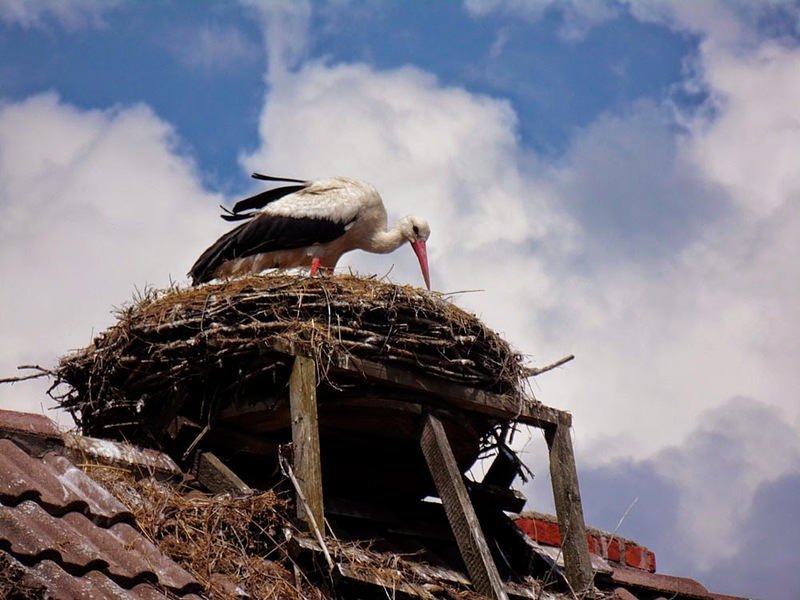 The nests are not that high, so you can really get a close look at them. 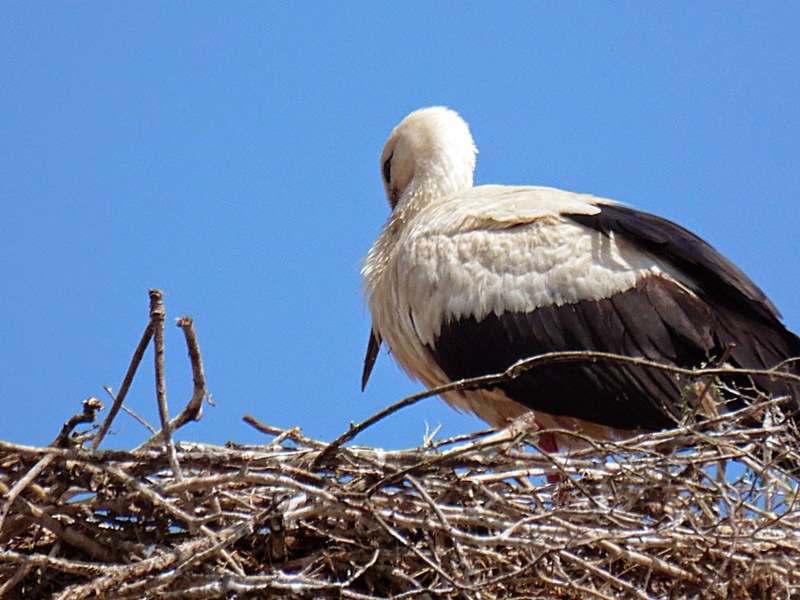 With a telephoto lens you can almost feel like you are on the nest with them. 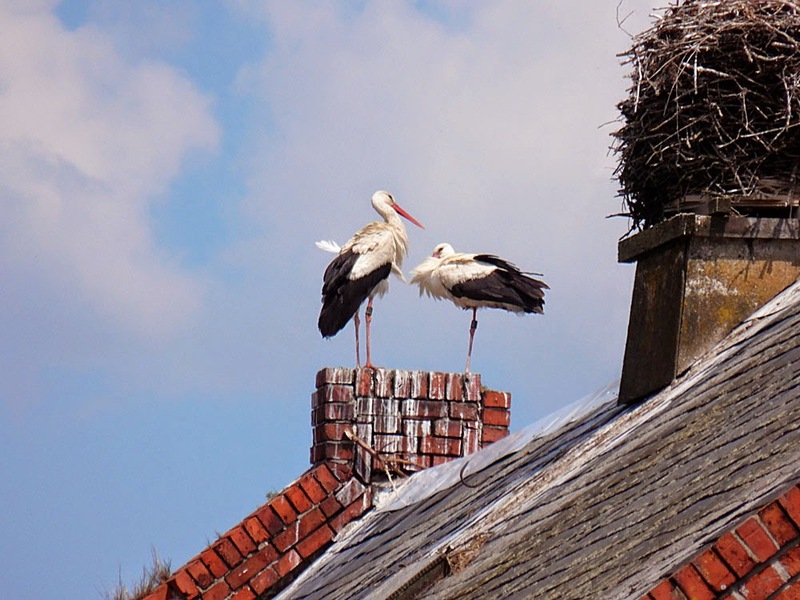 I suppose they have got used to the tourists gawping at them, and just look serenely down on them like they are lords and ladies of the village. 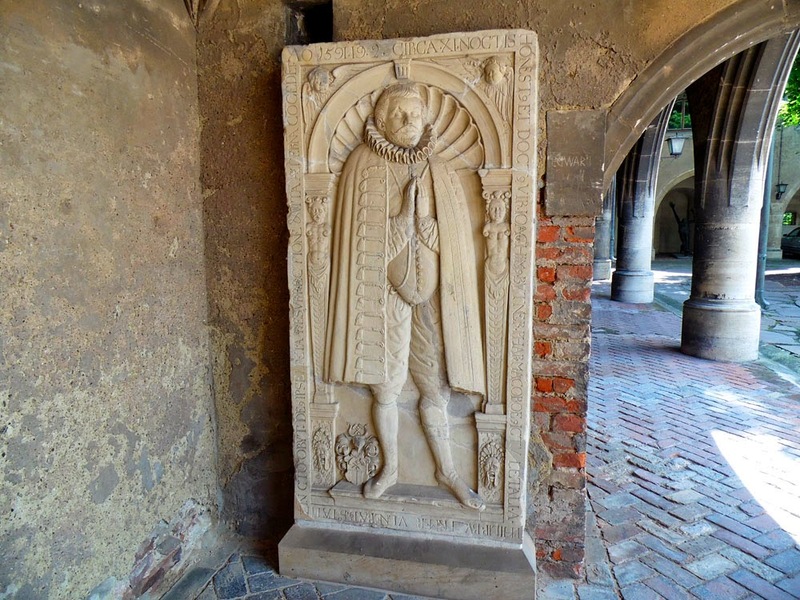 The village itself dates back into mediaeval times and probably gets its name (Rühstädt means in old German town of rest) because the crypt in the 13th Century church was the final resting place of the ancient Mark Brandenburg knights of von Quitzow. 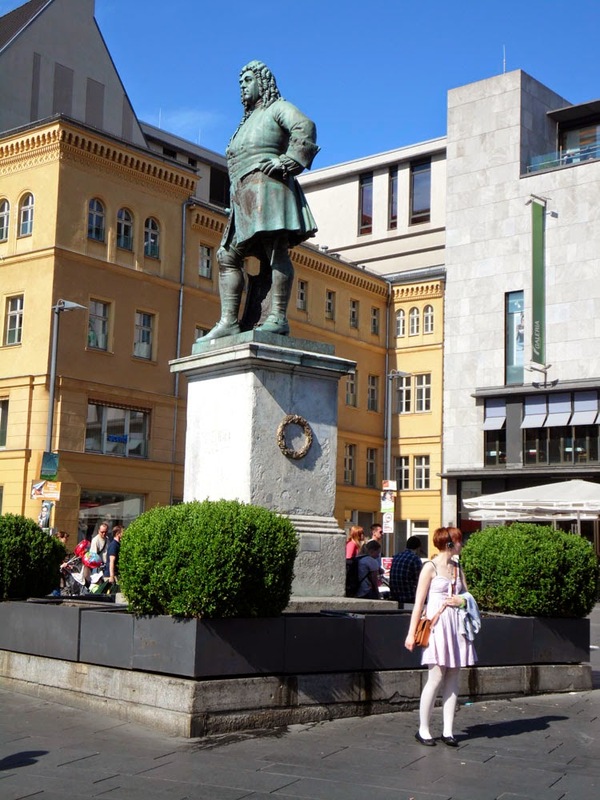 When the von Quitzow line died in 1719, the village and estate was granted by the Soldier King Friedrich Wilhelm I of Prussia to his old Tabakskollegium chum Major General Friedrich Wilhelm von Grumbkow. 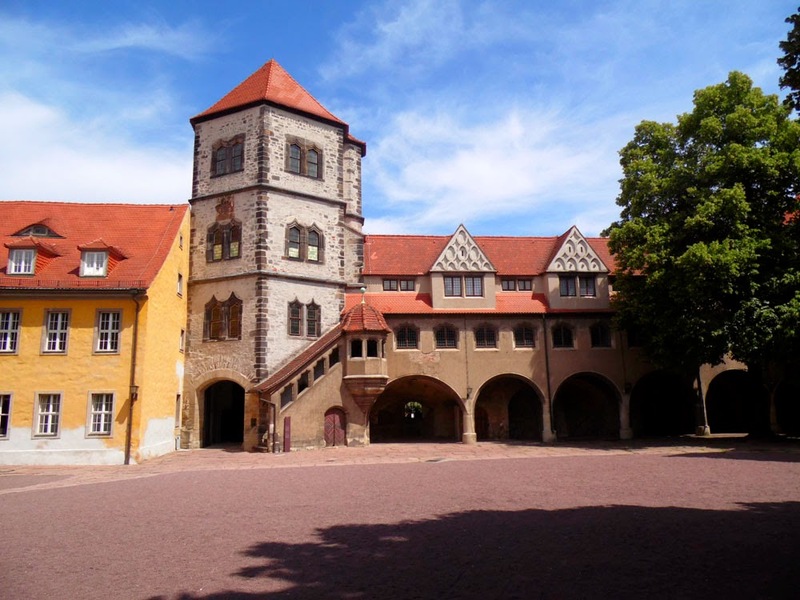 Von Grumbkow had the old castle at Rühstädt pulled down and replaced with an elegant single-story, three-winged Schloss. 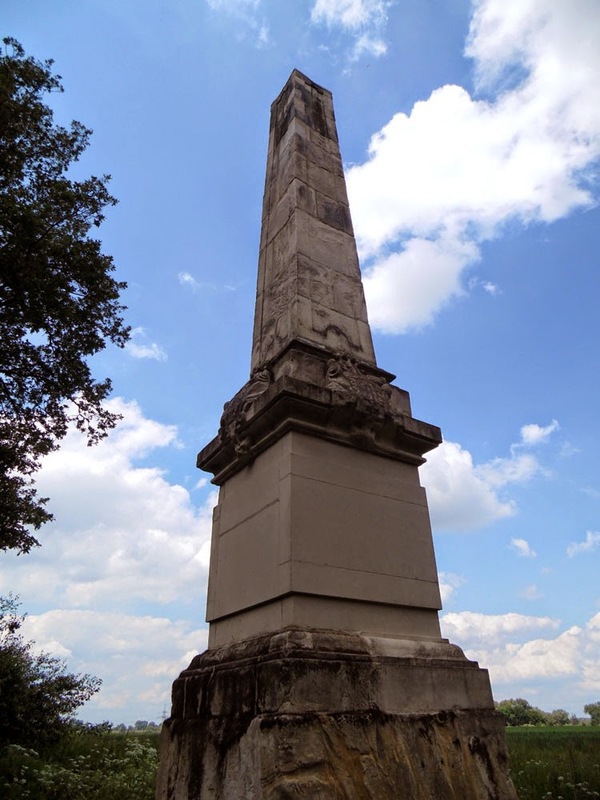 To commemorate the investiture of Rühstädt he had a 10 metre high sandstone obelisk erected at the Western end of the Schlosspark. 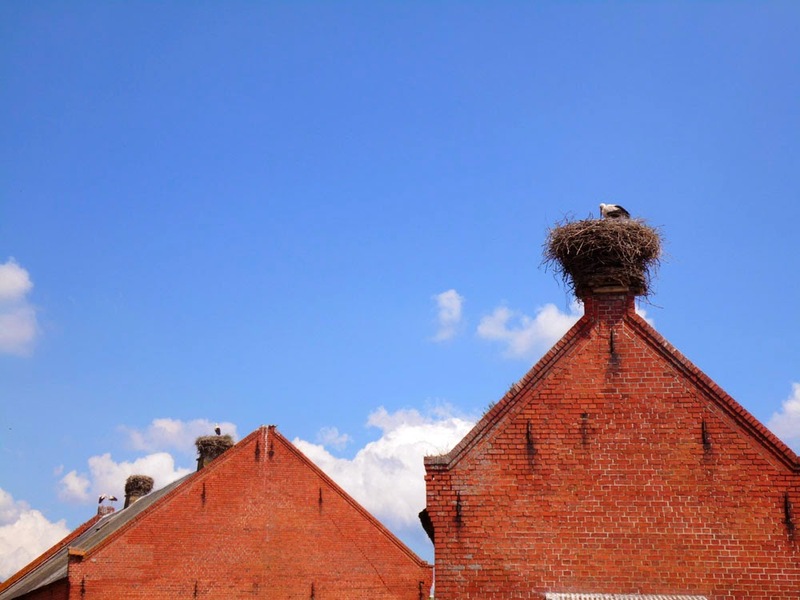 This was the first thing we came across of Rühstädt when cycling down from Wittenberge, and we wondered what it was. Now we know! It might have been easier to decipher if the von Grumbkow coat of arms and inscriptions on it had not been eradicated by zealous anti-Imperialists when the village came under Soviet control after the war. The heirs of von Grumbkow couldn't keep up the running of the village and Schloss and so they were acquired in 1780 by one Magdalene von Jagow (born a von Bismarck), who together with her husband Georg Friedrich Otto von Jagow had a baroque Schloss built to replace the old one.